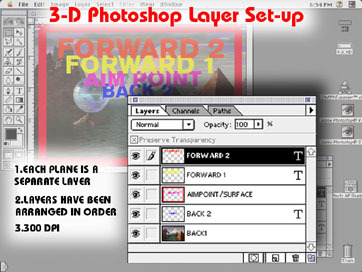 Files can be provided as layered PhotoShop files or as vector graphic files such as Illustrator. Should the file size exceed the limits of the storage media, separate files can be provided, but must be of the same resolution and dimensions. Files must not be flattened and must include alpha channels or clipping paths to allow for re-composition of individual elements. Vector graphic files must be capable of being ungrouped to allow extraction of individual elements. See illustration 2. Include all fonts associated with the project. Include vector graphic files of the type. Be sure to create outlines or paths for all type three (3 or III) fonts. This will ensure no delays should there be conflicts or corruption in fonts provided. Preferable vector format is Adobe Illustrator. If possible, avoid Quark Xpress documents as quark often utilizes proxies (low-resolution copies) of images and does not allow exporting type with outlines or paths. Quark files can incur extra creative costs if conversion to a suitable format is necessary.